Quite a few things happened at Coachella this weekend. N-Sync got back together, minus Justin Timberlake and they were joined on stage by Ariana Grande. Jauz, real name Sam Vogel, performed at the festival on Saturday and debuted his remix of the highly, highly popular kids' song in front of a large crowd in the Sahara tent during the daytime. As you'll see and hear, the remix mostly adds a bassline to "Baby Shark" before launching into a breakdown, which samples the song's chorus, before eventually building into the melody of Darude's classic dance track "Sandstorm." The remix came after a promise by Jauz back in November that he'd remix the internet favourite if he got more than 20,000 retweets on a single tweet. 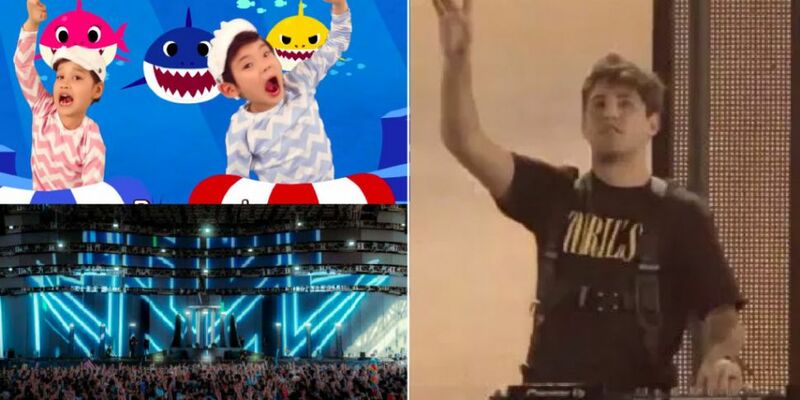 Following the performance, Jauz jokingly apologised "to all the parents who had their kids listen to my baby shark remix debut thru all my swearing." We think it's an absolute banger! What Are Your Favourite Song Covers?